The Most Reverend Patrick Feehan, the third Bishop of Nashville, established St. Patrick’s Catholic Church in June of 1866 and named as St. Patrick’s first pastor Father Martin Riordan. One of Fr. 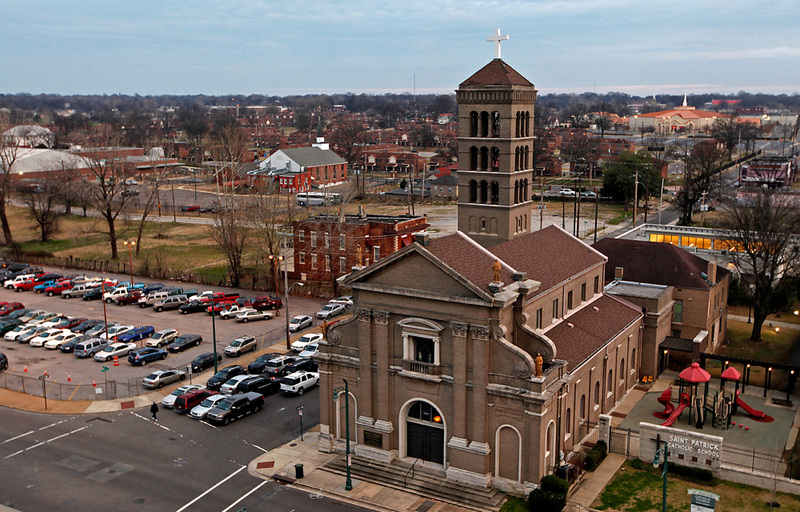 Riordan’s first acts upon entering Memphis was to buy property for the newly erected parish. Bishop Feehan laid the cornerstone, to much fanfare, at the corner of Fourth and Dr. Martin Luther King, Jr. Avenue (formerly Linden Ave.) on November 18, 1866. The first St. Patrick was a two-story structure with a school on the first floor and the church located on the second floor. From its inception, education has been a significant part of St. Patrick’s mission. St. Patrick Church and St. Patrick School served through three yellow fever epidemics, the great depression, and two world wars. St. Patrick School closed in 1950 due to a falling base of students whose families had begun to migrate to suburbs in the east. In 1954 the Missionary Society of Saint Paul the Apostle accepted responsibility for St. Patrick Church, and by 1966 what had been a missionary focus to the southeastern United States shifted to a focus on the immediate neighborhood surrounding the church. By 1970, the circa 1925 St. Patrick School building had become a neighborhood community center called the St. Patrick Center. The Center served as the neighborhood hub for educational and recreational activities for children and adults, including organized sports leagues, after school programs and adult literacy classes. A MIFA food pantry and other socially responsible programs were based in the center. In 1999, St. Patrick demolished the structure known as the St. Patrick Center and replaced it with two mobile buildings to house the educational programs. In 2002, The Assisi Foundation donated $600,000 to rebuild the Center with a focus on literacy. As a result of that generosity, the Catholic Diocese of Memphis committed to construct the first elementary Jubilee School. Both the Center and the School began classes and programs in the fall of 2003. In 2013, due to the declining number of priests in the order, the Missionary Society of Saint Paul the Apostle’s 58-year history with St. Patrick Church came to an end. The Parish was returned to diocesan oversight and priests belonging to the Diocese of Memphis now joyfully serve St. Patrick Church. 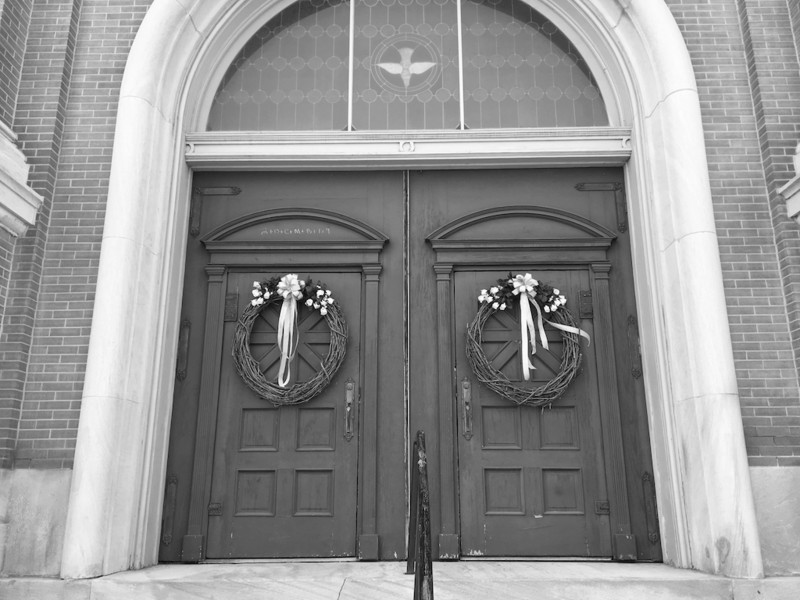 In 2016, St. Patrick Catholic Church celebrated 150 years of proclaiming the Gospel of Jesus Christ in Downtown Memphis. We look forward with a firm reliance on God’s grace to another 150 years. The Mission of St. Patrick’s Catholic Community is to proclaim and to live the Gospel message of unconditional love, healing and reconciliation through prayer, celebration and action on behalf of justice as a sign of hope for all God’s people.